Nestled just below the CP Railway trestle bridge, along the waterfront of the Seguin River and next to the stunning Parry Sound harbourfront, Trestle Brewing Company is the newest craft brewer to open its doors in Ontario’s cottage country. Their facility includes a taproom, retail shop, sunny patio for summer dining (and sipping, of course) and a clear sightline to their tanks and brewing operation that happens at the other end of the building. This open air design creates an atmosphere – a buzz in the room – where you just know something really great is happening here. Open year round, Trestle Brewing Company plays host to a number of great events throughout the year. Look for Craft Beer Cruises aboard the M.V. Chippewa III with local partners like Jessica Vergeer Studios in the summer months, readings by local authors with Parry Sound Books, film screenings with the Georgian Bay Biosphere Reserve and The Museum on Tower Hill, as well as lots of great live music by local musicians filling the room (and the seats). But what’s new this winter you ask? Read on beer lover, read on. 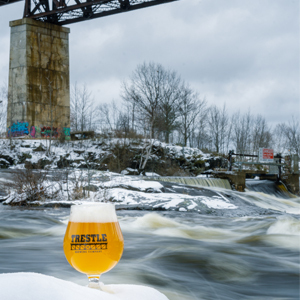 Introducing Trestle Brewing Company’s Ice Crocodile Winter Saison! With the change of seasons now well underway, the folks at Trestle have brewed this beer with a nod to all things Canadian. It starts with a base of Canadian grown pilsner malt, pale malt, wheat malt and flaked rye for a creamy mouthfeel. They then selected Ontario grown Cascade hops from Highland Hop Yard in Meaford that are freshly pelletized to provide a bitter and floral citrus character that blends seamlessly with the farmhouse yeast. 6.1% and finishes at an angry 34 IBUs! Also new to the Trestle lineup is their Imperial Stout, Brag Load. Brewed with nine different malts aged on real vanilla and coffee beans, it is a deep, rich and slow sipper that is meant to be enjoyed over time letting the flavours evolve as it warms up. And at 9% ABV, it won’t be the only thing getting a little warm. These new brews are available on draft in their taproom, to purchase in cans in the retail fridge inside the brewery, or you can even purchase online and have it delivered right to your door. Their online beer menu allows you to mix and match as well, so you can stock up on your favourites or enjoy a little variety. There are new things popping up on the menu this winter at Trestle with some delicious new additions available for you to try. The Trestle Nacho Board (see photo above) is a massive array of housemade corn tortillas with sides of Pico de Gallo, Sour Cream, and Black Beans. 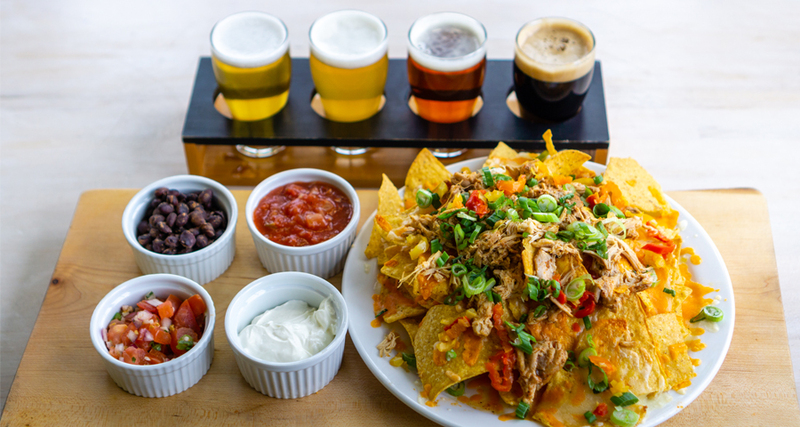 Up the ante on your nachos by adding chili, extra cheese, pulled pork or chicken as well. Interested in lighter fare? Try the new Vegetarian Flatbread Board (seen in the photo below). 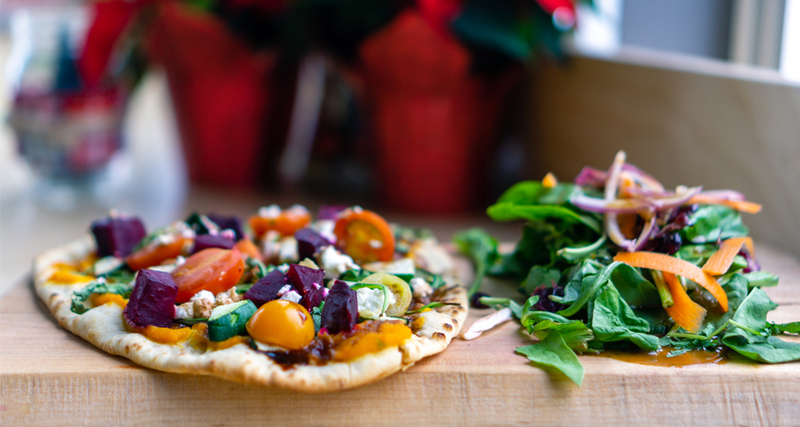 It features naan bread topped with roasted butternut squash puree, arugula, zucchini, cherry tomatoes, goat cheese and is dressed with a balsamic reduction. Staples on the brewery’s menu continue to delight: the Bavarian Soft Pretzel with in-house cheese sauce on the side for dipping is a total step-up on this ballpark favourite. If you’re a sandwich fan, be sure to sample the pulled pork or meatloaf versions on offer. If you’re in town on Wednesdays, you won’t want to miss the very popular Trivia Night at Trestle. Happening weekly in the Trestle Taproom from 7-9pm, wrangle up a group of friends, join a team, or come by yourself to test your arsenal of knowledge against the trivia quiz master’s array of questions. Prizes are awarded to the winning team each night, and lots of fun and laughs are promised for all. Like being one of the first to sample a new brew? Then Cask Night is for you. 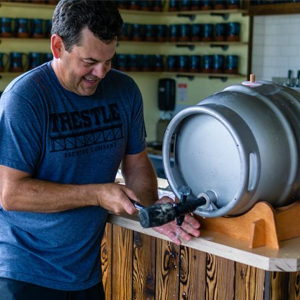 Every Friday Trestle taps a fresh cask their head brewer Matt Lyons has created. This is an exciting way they experiment with beer flavours and provides visitors to the Trestle Taproom with a truly unique offering. And get yourself out and about on Sunday afternoons and head to Trestle for Brunch at the Brewery. Taking place weekly from 11am-3pm, all your brunch-time favourites will be adorning the plates accompanied by special drink menu items like Beermosas, Caesars, Cappuccinos and more. Reservations are recommended. Partnering with the Georgian Bay Biosphere Reserve, Trestle is also the host venue to a number a screenings for the Films That Make You Think series including Before the Plate on February 12th, The Woman Who Loves Giraffes on March 12th, Generation Zapped on April 9th, and much more. For more details on these events click here. There’s also live music with Pat Maloney on February 8th, a Books & Beer event with Frank Wolf (in partnership with Parry Sound Books) on February 26th, and an Art Gala in support of Hospice West Parry Sound on April 5th. Keep an eye on their ever changing events lineup here so you don’t miss out on any of the action – some of the more popular special events sell out quickly. Once you’ve got your fill of all the awesome things going on at Trestle (and there is lots! ), head a little north to Nobel to check out the other craft brewery in the area, Norse Brewery. Owned and operated by the Rogozhkina family, the name Norse is a nod to their northern heritage. Their brews are all natural and their facility offers a retail shop as well as guided tastings of their delicious product; Norse Golden Ale, Norse Dark Ale and Norse Red Ale. And there’s lots of other things to do in Parry Sound too. Check out a show or concert at the Charles W. Stockey Centre for the Performing Arts, view the largest collection of Bobby Orr’s own memorabilia available to the public at the Bobby Orr Hall of Fame, rent a fat bike from Parry Sound Bikes and check out the Rotary and Algonquin Regiment Fitness Trail along Parry Sound’s stunning waterfront, or explore the downtown core and their lovely assortment of shops and restaurants. Plan a winter escape to the Cottage Country Beer Trail today! To check out some suggested itineraries click here. To plan your stay click here.